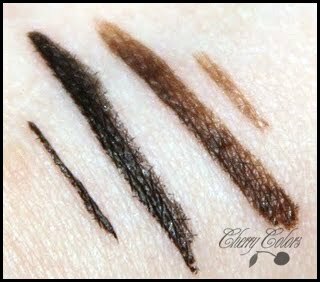 Review: E.L.F Waterproof Eyeliner Pen (Coffee) - Cherry Colors - Cosmetics Heaven! I realized that it's been a while since my last review.... :) So while I was thinking about today's experience with this eyeliner I decided to write it down. Aqua(water), Styrene/Acrylates/Ammonium Methacrylate Copolymer, SD Alcohol 40 (Alcohol Denat), Butylene Glycol, Sodium Laureth-12 Sulfate, Benzyl Alcohol, Methylchloroisothiazolinone, Methylisothiazolinone. I really don't understand WHY it has written waterproof on it if you can remove it with a water based remover? That really makes no sense to me. I got this eyeliner in a swap, and it's my first e.l.f. product. I got it in color Coffee, which is a not too deep brown. The left part is, how it applies with one coat, right part is two coats. I can't even draw a thin line anymore. That's so sad... but it's easy to use it and to draw nice lines... So I do use it quite a lot. But today I realized that it does one sad thing for me... It melts with my tears (my eyes water here and there), and it BURNS LIKE HELL! Today my eye was damn red and burning and it seemed like it won't stop ever again.. and I realized that it's because of this 'waterproof' eyeliner :/. +Comes in 5 different colors. +The package, I like the shape. -In contact with my watery eyes, it melts and then burns! -The tip got used up quite quickly. Overall: I do like it, except for the burning fact. I mostly use it on my lower line, because there it doesn't touch my watering spot (corner of the eye), so I don't get the burning sensation. Other than that, it's nice quality especially if you think that's only 1$! If I had the chance I'd buy all the other colors, just to play with them! It's really easy to apply (even for a makeup dummy) and with one coat you get decent brown color. With two (or if you press harder, but NOT hard) you get a darker brown, but honestly. I only use one because if I wanted a darker color, I'd use black instead. It goes off even with regular water, so it's not really appropriate for summer (at least for me). But other than that, it's a great eyeliner. I just wish it could stand up to its name (waterproof).